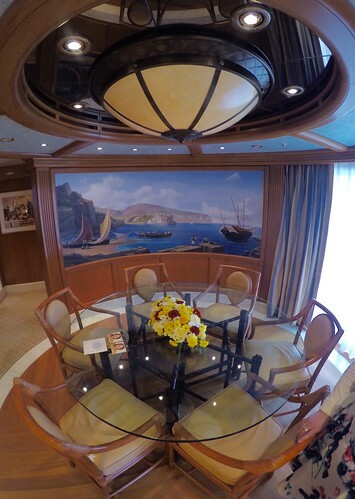 Recently I spent time on board MSC Preziosa as part of #BlogCampOnBoard, organised by Trips 100. 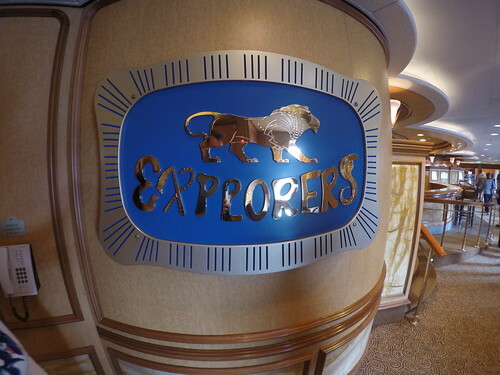 The purpose of the day was to meet fellow bloggers, undertake blogging workshops, as well as experience everything that MSC Cruises is known about. 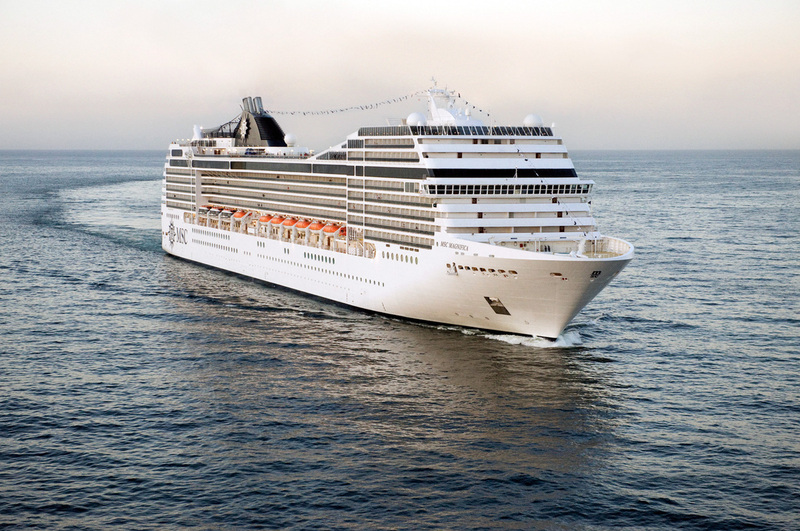 I’ve previously spent some time on board MSC Splendida, the sister to Preziosa, so I was keen to compare the two and what they have to offer. 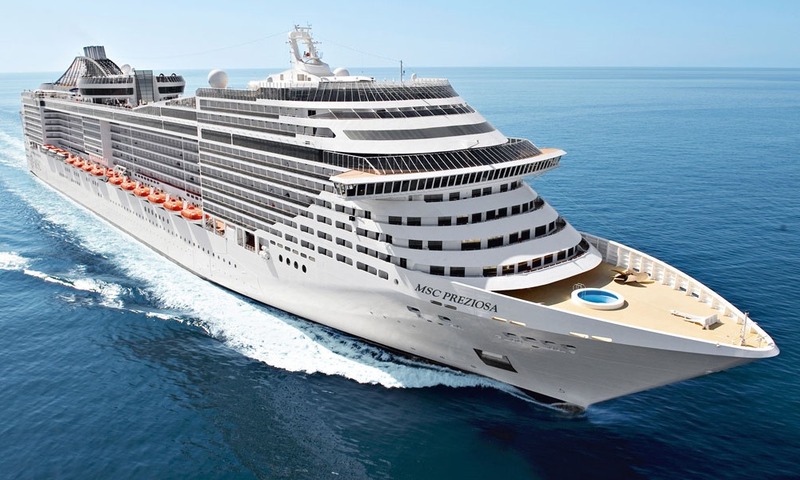 MSC Preziosa debuted in 2013 and is the final Fantasia Class ship for the line. 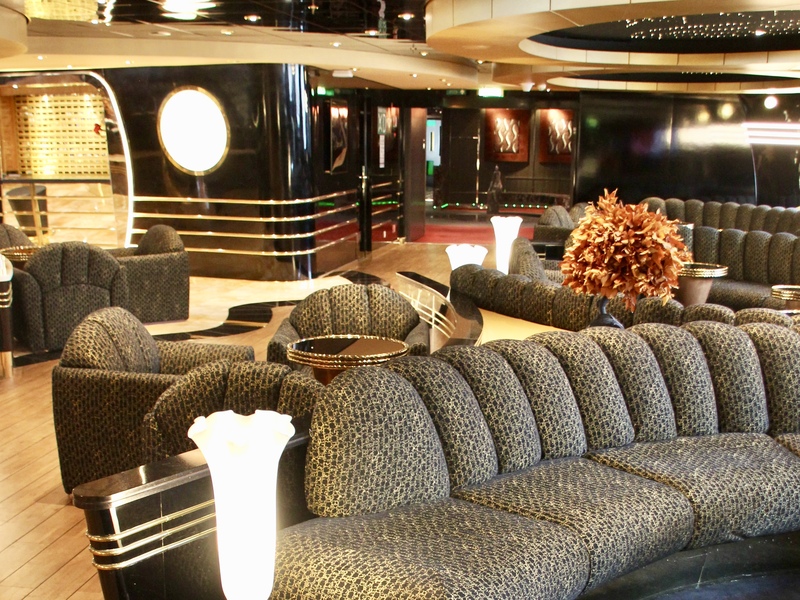 MSC are known for their Italian andMediterranean flair and Preziosa is no exception. 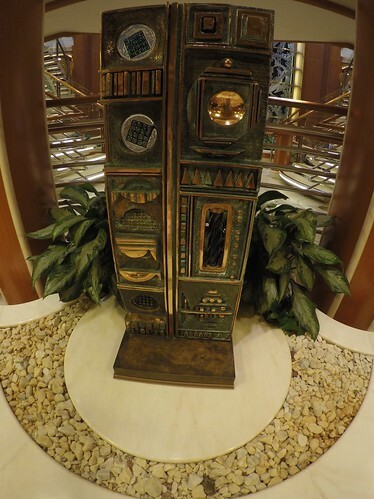 Everywhere you look you can see this influence, from the use of vibrant colours, metals and gemstones throughout the ship, to the art, and the design of venues, yet for the most part still retaining a cosmopolitan feel. Preziosa is definitely an evolution of the class design compared to Splendida, with much more darker and richer tones, for instance in the wood that is used around the ship, yet for the most part is almost identical. Despite being one of the largest ships in the MSC fleet, she does not feel it. Walking around during the day I felt that venues tended to feel much more intimate than on other lines, with nooks and crannies everywhere to sit, chill or interact with fellow guests. From the little time I’ve spent on board, the staff are also very friendly and helpful, as well as genuinely wanting to spend time to get to know their guests. Again this brings a warmth to the ship and the experiences on board – ultimately that is what will make a good cruise great. The Atrium, and those stairs! 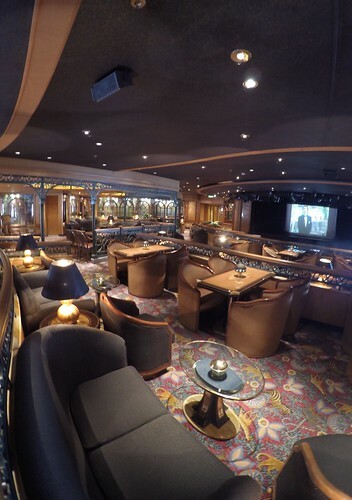 As you walk on board Preziosa, you are welcomed into the heart of the ship, the atrium. This vast space is a hub of activity with shops, bars, cafes and guest services. During the evening you can see how this would come alive with live music, dancing and other activities. 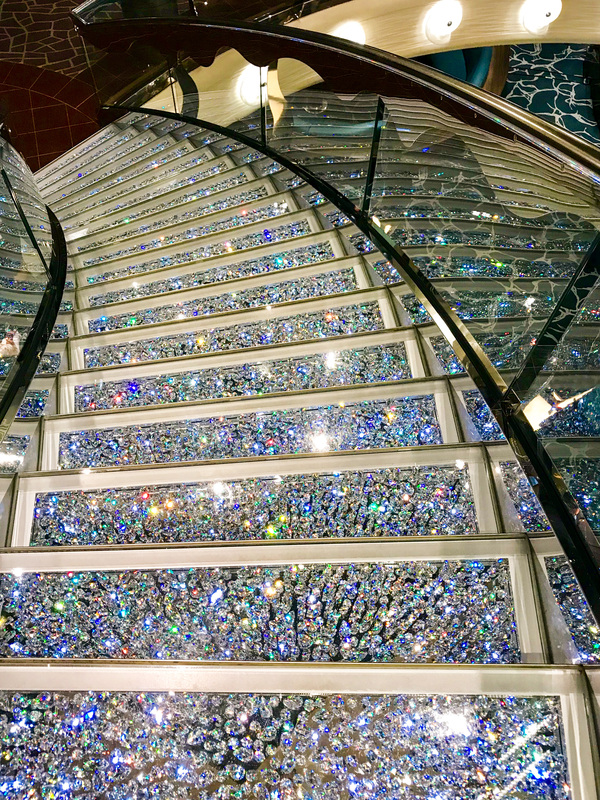 The crown of this space, and perhaps the ship, is the infamous Swarovski crystal stairs. Each step of these staircases costs $8,000. 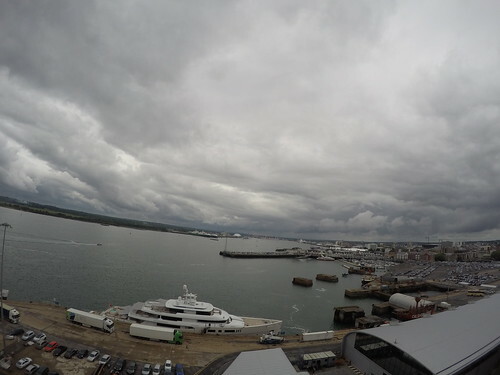 The pool space on board Preziosa, the Aqua Park, is really lovely, even in blustery Southampton in October! 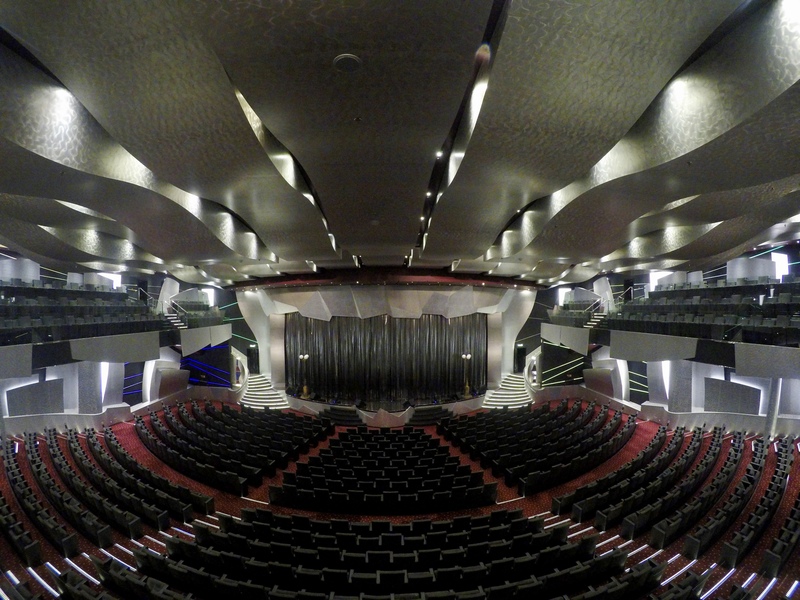 The main pool space is well designed and feels very open, with a stage that no doubt hosts numerous activities during a voyage. Next to the main pool is the covered pool, La Playa Preciosa, which as you can imagine was quite busy in October. Again, despite this being covered it is a vast space to relax, swim and take in the world. 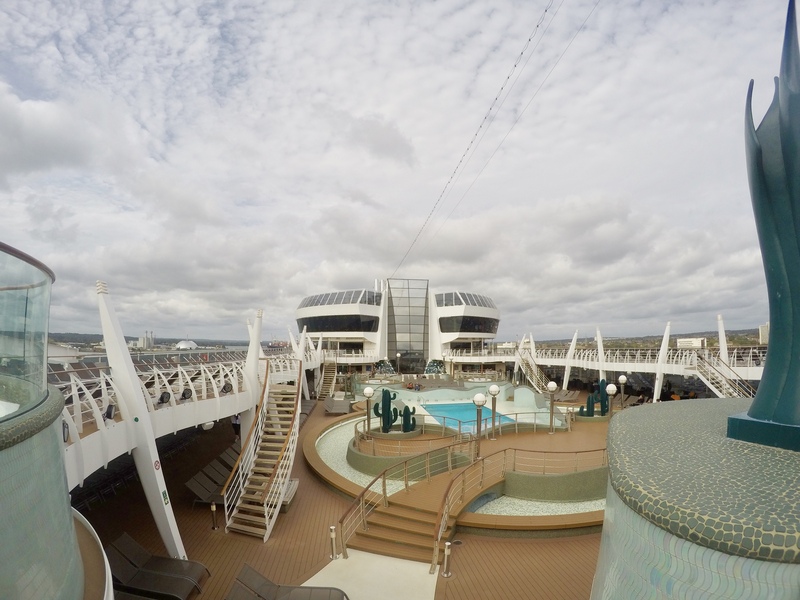 When the ship is in warmer climates the roof can be retracted to create an extension of the main pool area. 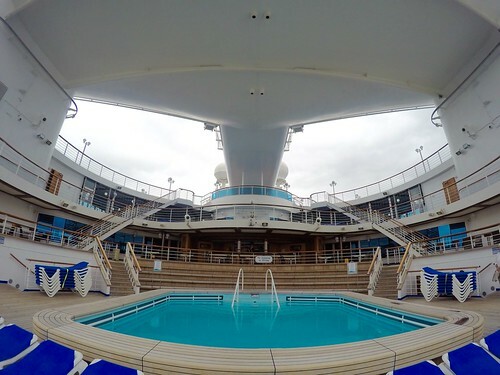 Towards the aft of the ship you’ll also find another smaller pool, the Garden Pool, an infinity-style pool space which I imagine will be an oasis of calm and tranquility on board – that’s definitely where I’d sit! 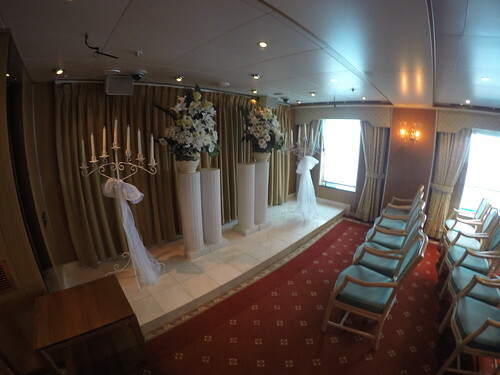 The Aurea Spa on board is a well-appointed space at the front of the ship. Here you’ll find a large gym, a hairdressers, as well as a juice bar and a multitude of treatment rooms. Unlike on other ships, this doesn’t feel shoehorned in, it takes up a lot of space (quite rightly so!) 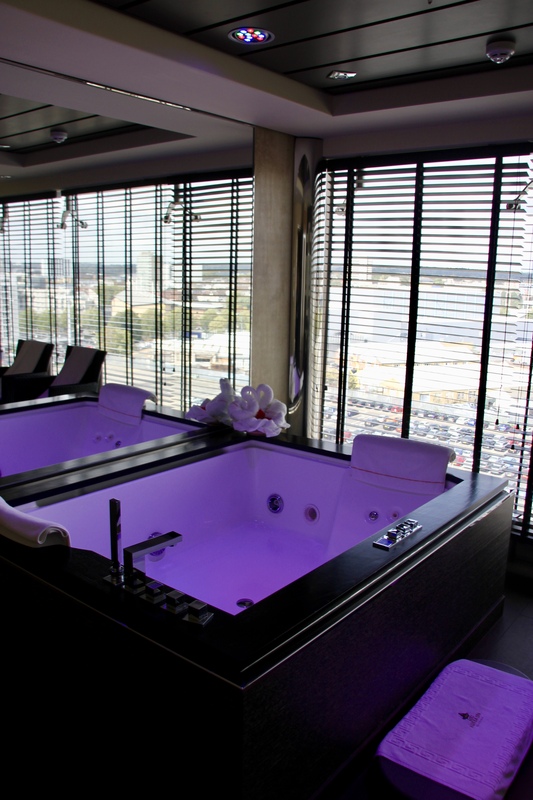 to make it feel opulent, just what you want if you decide to be pampered. 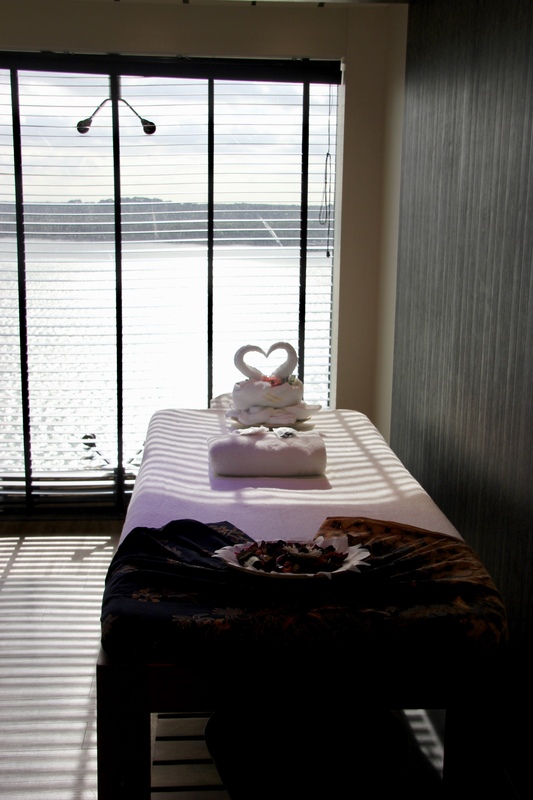 For me I like the fact the treatment rooms look out directly onto the ocean, that connection is what you want when you are seeking such a treatment. Whilst I didn’t eat here (unfortunately! ), I have to say I was very intrigued by the offer of Eataly. 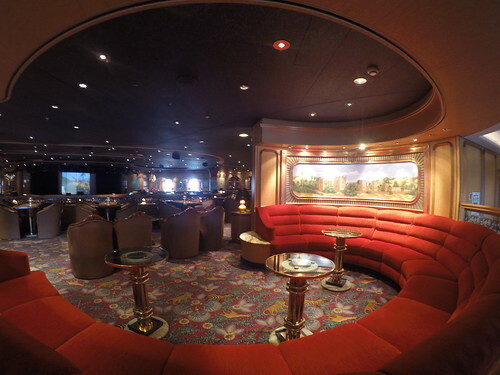 The food looked amazing and the design of the venue was very different than on the rest of the ship, this was an open, contemporary Italian restaurant. MSC is rapidly growing and evolving. This year they launched a new class of ship MSC Meraviglia, a true evolution of the brand, and in November 2017 MSC Seaside will debut. 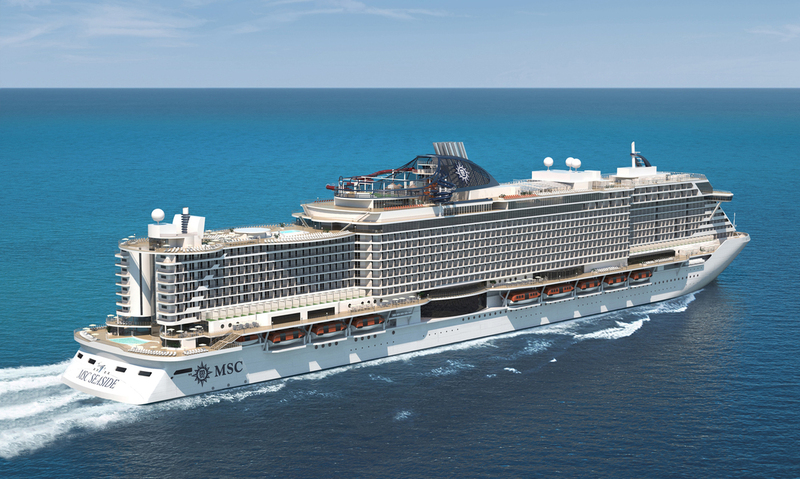 MSC Seaside is a new take on both the structure and concept of what a cruise ship is, and will be an interesting addition to the fleet. In 2018 the line will launch sister ships to both of these new classes, MSC Bellisae and MSC Seaview. To learn more about these ships visit here. It is also an interesting time for the UK market, with MSC Magnifica homeporting out of Southampton in 2018, with 23 consecutive sailings, as well as MSC Meraviglia making a number of calls to the UK. MSC are looking to refine the brand for the UK market, for instance with their new partnership with Yorkshire Tea and providing kettles in every stateroom. To learn more about Trips 100 please go here. 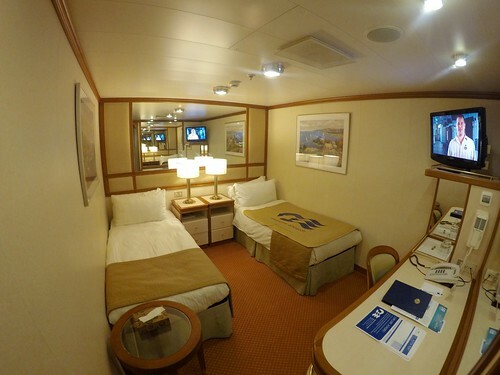 Blog, cruise ships, Reviews blog, blog camp on board, MSC, MSC Cruises, msc preziosa, review, ship, ship tour. permalink. 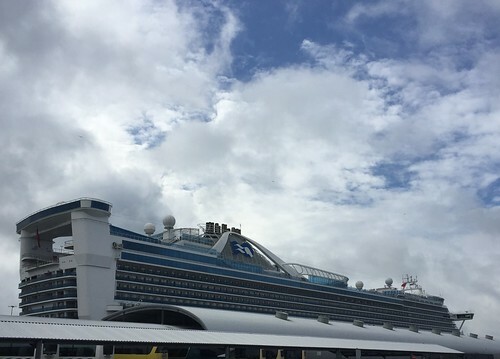 Why should you try a Celebrity Cruise?